•Be conducted via a technologically-based source. -Excluding the victim from activities, conversations, or social network sites so they feel socially isolated and alone. -Harassing the victim via abusive and/or threatening messages, causing them to fear the person doing the cyberbullying. 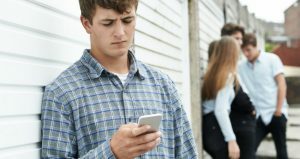 -Dissing the victim by sharing something personal about them, the intent being to damage their reputation or damage their relationships with others. -Outing the victim (sharing a piece of extremely private information) in an attempt to humiliate them. Sometimes, the cyberbully gathers this information through trickery by first gaining the victim’s trust in an effort to extract the information for release. -Cyberstalking the victim, causing them to feel as is if their physical safety is compromised. This fear can be real or perceived. -Fraping the victim, which involves impersonating the victim by signing in to their online accounts, then posting something that could damage their reputation or otherwise put them in harm’s way. -Catfishing, or setting up fake accounts with the victim’s information and images, then posting things on these accounts that will likely damage their reputation. The post How to Deal with Cyberbullying and Substance Abuse appeared first on Giver on the River.